Obesity is the state of being overweight. The accumulation of the fat in the body have make a negative effect on the body. A person is considered as obese based on BMI factor. BMI (Body mass index) is a method used for the measurement of healthy weight. In the gastric bypass surgery, reduces the size of thestomach and causes food to bypass the small intestine. In this procedure 75 percentages of the stomach is removed and limit intake of food. 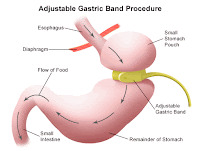 In gastric banding, band the upper part of the stomach which limits the amount of food and feel full after eating less amount of food.